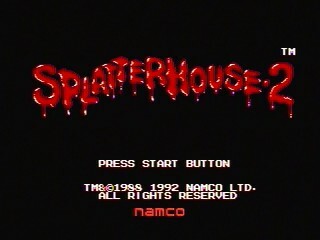 Released in 1992, Splatterhouse 2 picks up 3 months after the first game. The Terror Mask, which reconstructed itself after the events of the first game, appears to Rick, telling him to go "back to the house" and that "Jennifer doesn't have to die". Rick decides to go back to the mansion for another round of monster slashing. While most of Rick's attacks remain the same, new additions to the gameplay include a difficulty setting and a password system. Best time: 0:15:56 by Zack 'Zallard1' Allard on 2014-06-20. -There is essentially zero randomness in this game. As far as I can tell, the only random event I could even notice was the first orb in the stage 7 Jen fight. It could either fly straight over the screen or attack you. -The slide works a little differently compared to the first game. There are 2 rules that need to be followed if you want to execute a slide. You need to reach a certain height in your jump before the game lets you perform the slide, although if you jump full height, it will work every time. You also cannot jump kick in the same jump you want to slide kick out of. -Maneuvering in the air with a weapon is more difficult than it was in SH1. This is mostly only evident on the stage 3 boss just because you need to turn around after doing a chainsaw attack while jumping to hit 2 corpses on opposite sides of the room. -The hitboxes are very not in your favor anymore. Sometimes punches will go straight through an enemy sprite, but instead you get hit! It's also worth mentioning your punches/kicks are out for less frames than in SH1, so timing every attack is critical. Those differences do mess with the feel of the game if you've just finished a playthrough of Splatterhouse 1, but once you get used to them, it's not so bad. Anyways, here's a level by level breakdown. Stage I: Very simple stage with not alot to go over. The boss fight can hit you if you don't time your kicks correctly, but thankfully it went down perfectly this time. Stage II: The 2nd section went picture perfect. Not getting hit by the last set of retractable spikes is very difficult. I think I've gotten it like 3 times ever when running this. The boss fight went perfect for not being able to maintain 30Hz mashing like the TAS does to maintain slidekick state while jumping. This was easily a gold split. Stage III: Easily the worst stage in this run. You need to tap jump at the end of the first section just short enough to where you get enough height to jump the puddle, but low enough to where the enemy above doesn't hit you. I tapped it too fast and ended up getting a bath. This is probably the most significant mistake in the entire run though, so it isn't all bad. The boss is pretty tough too due to difficulties attacking twice in the air with the chainsaw in 2 directions. Also if you miss the clipper throw, it's an instant reset. Stage IV: Pretty solid stage overall. If it isn't already clear, the blue ghosts reverse your controls when they swoop around you, so you need to reverse dpad movement to compensate. If you get multiple on you, the game lags to a halt, so you want to shake as many off as possible. The boss is a pain if you don't do the quick kill, but if you get the slides correctly, he has no chance. Stage V: This is the hardest/longest stage in the game, which is a pretty consistent trend in the original 3 Splatterhouse games. Getting that first shotgun is maybe the most stupidly hard thing in room 1 because for some reason you can't pick up the gun when you tap up most of the time. It might have to do with lag or maybe that you need to be in the "weapon geting" position for longer than the old game. Room 2 I take an intentional damage boost to clear the hands closing in on both sides. Room 3 is pretty straightforward stuff. Room 4 I needed to stop once because I need the slime that I jump over to despawn itself, or else things get real nasty real quick. Room 5 is the coolest part of this stage, but pretty tricky. You need to pick up potion items (which I remind you, are harder to pick up) and toss them at Dr. Mueller mid jump so the wind up doesn't slow you down when you hit the floor. Damage boosting is pretty important too since it keeps you moving. If you look close enough at the first boost you can see the game throw 2 doctors at you, which is just great. Barely survived the final gauntlet of fire drops and make it to stage 6. Stage VI: This is an ultra simple fixed length stage that is entirely determined by the boss at the end getting hit once. Nothing too wild. Stage VII: This is a pretty critical stage for it having 2 "autoscrollers" and a boss fight. The 1st room is pretty consistent with no way to speed it up. 2nd room is the fight with crystallized Jen, which is easily dealt with by slide kicking. The ball on the top gave me bad luck, so that wasted a tiny bit of time. The room changes into a chasing autoscroller with blue man group shooting lightning orbs at me. Now the end of this section is critical. I can skip the cutscene where you step through the portal and finish the stage earlier than intended. You need to get to the very end of the section before the game takes control of Rick (my cue is lining up with the ghost's jaw above me). Then, as soon as Rick is about next to the score count above, do a full jump and slide backwards. If this slide is not perfect, you will get stuck on the back of the screen and you lose about 8 seconds, but if you land it you save 6! Stage VIII: The final stage has 2 boss fights, and both went basically as well as they could have gone. I got hit on the 2nd form of the final boss, but I had to wait for him to appear on screen anyways, so time loss is negligible. It is VERY easy to miss the slides on the bat form of the boss, which has pretty much ended several attempts from just wasting so much time there, but thankfully this time it was perfect. My goal for this run was initially sub 16, but the closer I got to it, the harder it seemed to pull off. I was pretty shocked to see that I cleared it pretty handily with this run, so I'm pretty satisfied with it! I hope you enjoy this run!